Poems and other fun facts. your purses and hatch out small change. 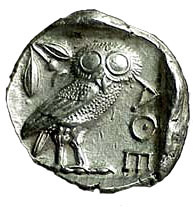 Tetradrachm of Athens c.450 BCE.
" Taking forth a bowed groat and an old penny bowed he gave it (sic) her". 'Oh, ho! say you so? Money will make the mare to go.'" Why is a coin round ? The earliest known specimens of the coins were made of electrum ( an alloy of gold and silver). They were made in the kingdom of Lydia (western part of present day Turkey) around 700 BCE; probably to transform trade from a cumbersome barter system to a monetary system.1 Others speculate that they were stuck as offerings to the Gods in their religious ceremonies. Lydia was on a caravan route from Greece through India to China. Coins were also thought to be independently invented in China and India too (for detailed discussion see Invention of coins). The early coins were of different shapes - round, square, oblong, spade like and knife-like. Among the early civilizations, gold, silver and bronze coins were the units of value for the exchange of goods and services. The same coins were going round the centers of trade on the caravan route. This observation made the Chinese traders to say that the coins meant to roll around the world should themselves be round.2 Thus, the 6th and 5th century BCE spade like chinese bronze coins were replaced by round bronze coins in the later centuries. Thus de facto shape of the coin became round, but some of them are still struck in various shapes. Why is it called a coin ? The word "coin" was derived from the Latin word "cuneus" meaning wedge. 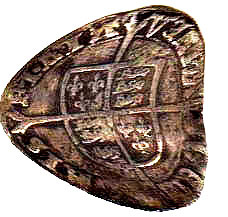 A wedge shaped die was used to stamp small pieces of metal that were used as money. The word coin was applied to the stamped image on the money. Later, the word was used to denote the money itself. and other money matters ! The word "Capital" was derived from "Capita" meaning head of the cattle. Cattle used to be the wealth of the people in nomadic communities and early civilizations. The oldest greek coins had an impression of ox on one side. In Roman times a bribe for silence was said to be an "ox on the tongue"3. 1. According to money : A history. by Jonathan Williams. 2. Money talks. N. N Pai. 1980. Numismatic Reference Acknowledgments Life, Liberty and Laughter? Email.